The Mi&Co shop lives and breathes Formentera - it is decked out in recycled timber and is full of references to the island. However, Mi&Co is a brand with its roots firmly planted in Barcelona. In fact the shop was born just three months ago from a family business with over 30 years experience in the children's swimwear sector. 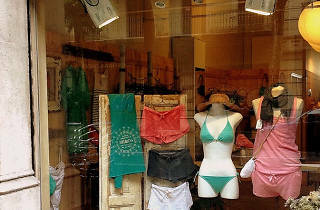 If you are looking for swimwear made in Barcelona, Mi&Co promises 100% locally-made products, from the textiles used to their patterns, the design and manufacture.